Of all the furniture in an office, the office chair is often considered the most important as its features and functions can directly impact one's health. A chair's functionality, such as height and tension adjustability, can encourage proper posture, reduce fatigue, aid in appropriate blood flow, and minimize the risk of repetitive stress syndrome — specifically carpel tunnel syndrome. To select the chair that's best for you, carefully consider how the chair will be used and the functionality needed. Matching the intended use of the chair with its functionality will ensure your selection meets your needs, equating to a more comfortable, healthy and productive environment. Full-body support is imperative in this setting so select a chair that offers tension and height adjustments. In this scenario, the chair needs to accommodate more than one user so adjustable height functionality is essential. For optimal comfort and support, you want to have the ability to adjust the height and tension of your office chair frequently and easily. Pursue a chair with a pneumatic, or gas, cylinder that sports convenient paddles readily available from a seated position to make overall height modifications. An office chair should always be adjusted to the user’s body, not a desktop or other surface. Especially for chairs that are shared, it is important that each user easily adjusts the chair to their height. No one wants to enter a conference room to find they need to turn their chair upside down to make adjustments. This is important in the home or multi-shift office as well. "An adjustable cylinder can help you obtain proper posture by creating a 90-degree angle between your upper and lower legs. This minimizes fatigue and ensures appropriate blood circulation. It also helps reduce neck, back and other muscle strains." If you spend at least 50 percent of your day keyboarding or at a desk, adjustable armrests are an important option. Armrests that feature easy height adjustment allow your shoulders to relax, your elbows to stay near your body, and your arms to remain straight, supported and parallel to the floor. This is also an important functionality to consider if the chair you are purchasing is to be shared among users. "Adjustable armrests can help you avoid repetitive stress syndrome, specifically carpel tunnel syndrome due to the elimination of unnecessary stress on the arms." Functionality such as back tilt, back angle adjustment, and tilt lock can directly lead to a comfortable, productive work environment. These features offer the user necessary resistance to lower back movement, conformability to your spine’s natural curvature, and support for a variety of seated positions. An adjustable back also allows you to cater equally to users of different heights. "Adjustable lumbar support is a function that helps distribute one's body weight evenly throughout more muscle groups, reducing muscle stress, strain and discomfort, and minimizing fatigue." Aside from the comfort and support realized through height and tension adjustments in the cylinder, armrests and back, comfort and support can also be found through the chair's shoulder and seating areas. It is best to opt for a rounded, sloping or "waterfall" style seat cushion for proper blood circulation, which a square seat can restrict. Colors and styles. Consider the aesthetics of your office chair and how it will coordinate with your office space and total office furniture collection, as well as the image you want the chair to portray. Fabric and flexibility. Consider a chair that offers breathability, such as a mesh-back chair. Just because high-back and overstuffed pillow-back chairs are bigger, they aren’t always better. Floor surface. Consider the floor surface in which your chair will be used. For hard surfaces, such as hardwood, you need a soft chair caster. For soft surfaces, such as carpeting, a hard caster. Base upgrade. Consider upgrading your current office chair if it has a four-star base as it is outdated. Several years ago, the government mandated the safer, five-star base. Shoes. Consider the different shoes you wear and how they may affect the necessary height of your chair from one day to the next. Before selecting "buy" – ask yourself these final questions. Will this chair work for its intended use? Does this chair have the functionality I need? Will this chair offer comfort and support? Functionality, such as height and tension adjustments, and support and comfort are imperative to selecting the right office chair. 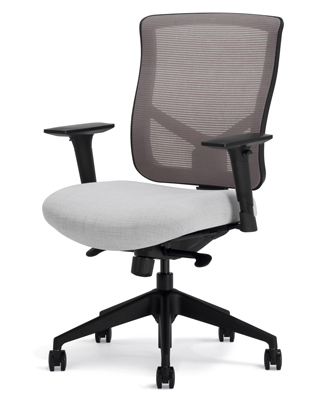 When offering full support and adjustability to the user's body, an office chair promotes good health and workplace productivity. If the chair will be used on a hard surface, tell the sales representative so it includes soft casters. The standard hard casters aren't designed for hard floor surfaces. Please refer to individual product pages for specific details and additional information.